New Ultra-Sensitive CMOS Sensor Called STARVIS from Sony. 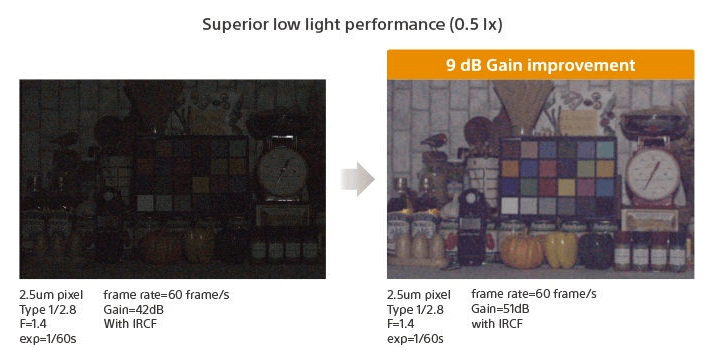 Starvis Sony sensors can see in nearly dark conditions! Sony has been creating buzz with its ultra low light performing sensors and mirrorless cameras. The STARVIS is New Ultra-Sensitive back-illuminated pixel technology used in CMOS image sensors for surveillance camera applications. It features a sensitivity of 2000 mV or more per 1 µm2 (color product, when imaging with a 706 cd/m2 light source, F5.6 in 1 s accumulation equivalent), and realizes high picture quality in the visible-light and near infrared light regions. Sony also introduced Pregius sensor. According to Sony The Pregius is global shutter pixel technology for active pixel-type CMOS image sensors that use Sony’s low-noise CCD structure, and realizes high picture quality. Here is a short video showing its capabilities. It may not be long before we start to see this technology being used in professional digital cameras. Currently it will be used to boost surveillance capabilities during low light conditions.